We will make a 14” hanging planter in a coconut fiber basket with black wire. The focus will be on plants that can tolerate cool conditions and thrive well into summer. Join Hattie White for an in depth look at how best to create the garden of your dreams. Because our summers are fairly short, gardens that take into account the whole calendar are the ones that bring the most visual appeal. The added benefit of winter appeal is that it will attract birds to your property in winter and give you beautiful structure and contrast during the grey or snowy times of year. This workshop will help take the confusion out of planting for year round interest. 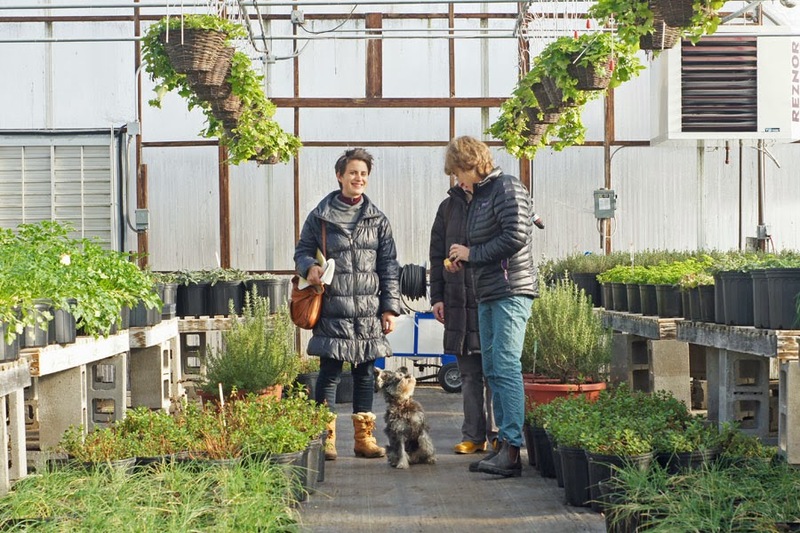 Whether this is for a specific area of your yard or for a dream garden for the future, this workshop will work through the basics of choosing the right plants for the space. Come prepared with some basic information about your garden- how much light does it get, is it wet, dry or somewhere in between, what is the area like? In the workshop each participant will create custom plant lists and simple garden plants for their garden that will ensure year round interest with plants that will succeed. As with all of our workshops, we create a fun learning environment with lunch and lots of fellow plant lovers. Bring a friend and make a day of it! If interested you may tour the greenhouses and herb farm after your workshop. $30 fee. Hattie White is a garden professional with a passion for helping people feel more connected to the landscape around them with education, resources, and enthusiasm. She has been working in the nursery trade for over 8 years, specializing in perennials with a focus on native plants and sustainable garden techniques. Currently she is in the process of getting her horticulturist certification and works at Red Wagon Plants during the season. Hattie also owns Apis Garden Coaching, which specializes in helping gardeners of all levels with a wide range of projects, from plant IDs, project management, site specific plant lists, and custom resource guides to native/pollinator gardens and small scale ecological garden design. In the off season she spends her time researching new plants and techniques, learning botany, and a wide variety of crafts at her home in Underhill, VT.
Come to our greenhouses to make a spring planter with owner, Julie Rubaud and Red Wagon staff, and have a little happy hour with plants and friends. We will give you some tips and pointers on making a planter using cold hardy flowers, herbs, and even vegetables in combinations that work well and can be used all spring. You can choose the type of pot to use, and wander through all of our greenhouses to pick out your plants. Evening time in May is just so special at the greenhouses and we would like to share that quiet beautiful time with you. The plants just glow and the new growth all around is sure to leave you feeling refreshed and inspired. It's a perfect way to spend a couple of hours with a friend or a group of friends, and we are keeping the size small, to just 10 people, so we can have a garden fueled conversation or just enjoy the quiet time with plants and twilight and the company of each other. Included in registration fee: Materials to successfully make 1 large planter. We have an assortment of pots to choose from, but if you prefer to bring your own, please feel free to do so. Light refreshments provided. If you would like wine or beer, feel free to BYOB. You can read about our Make and Take Tuesday from last year here. Red Wagon Plants takes its show on the road with the 9th annual New North End Plant Sale! This is a great opportunity to buy our plants without making the trip to Hinesburg. We'll be on site with our plants to answer your gardening questions and help you choose what is right for your garden. Our plant sale has become a mini-garden festival of sorts with music from DJ Brunch, bagged compost for sale from Green Mountain Compost, and burlap bags for mulching your garden from Vermont Community Garden Network. Come join the fun! This event is a fundraiser for the Burlington Area Community Gardens Scholarship fund. Your dollars will help hire interpreters and expand garden plots to assist refugees and low income people with growing their own food. You can find more information about BACG here. Each year, our friends at the hospital put on a fantastic plant sale for employees and community members. If you are in that neck of the woods on May 21st, check it out and support their innovative nutrition department staff and programs. While you are there, you could take a walk through their beautiful roof top garden and eat in the delicious cafe. Find our friends at the Colchester Avenue entrance near the Harvest Cafe at the main UVM Medical Center building in Burlington. Learn all about the right plants to grow in a planter for a shady nook. We will have lots of plants for your selection, nice pots to choose from and some snacks and beverages to make your time at the greenhouses fun and productive. We will encourage you to branch out and use perennials, annuals, foliage plants, and even edible plants as part of your unique creation. Shade planters can bring a porch to life or add a little sparkle to that dark corner in your yard. The greenhouses after hours are a magical place to be. All is quiet, cows are grazing in the distance, and we have wonderful views on our special hidden patio. Bring a friend or two and make this a special evening. We will supply light refreshments. If you would like beer or wine, feel free to BYOB. Join us for the 10th Annual Sweet Potato Slip Sale at our greenhouses. This event is a fundraiser for the Vermont Community Garden Network. We will provide you with booklets full of instructions and recipes, plus we'll have samples of yummy sweet potato dishes. You can meet the great people from VCGN and hear about the powerful community work they do bringing gardens to all parts of our state. In this class, we will focus on making a hanging basket to hang in a shady area. Learn all about the right plants to grow and hand under a roof, on the north side of the house, or in any other location the sun doesn’t shine. We will have lots of plants for your to combine in a 14” coconut fiber basket. We will encourage you to branch out and use perennials, annuals, foliage plants, and even edible plants as part of your unique creation. Shade hanging baskets can bring a porch to life or add a little sparkle to that dark entryway on the north side of the house. $50 fee includes hanging fiber pot with black metal hanger, soil, and enough plants to fill the hanging pot. In this hands on workshop, we will show you and demonstrate some trellising techniques for peas, tomatoes, pole beans, and more. We will also go over proper pruning of tomatoes, which depends on the trellising methods used, so that you will maximize yields and help your plants stay as healthy as possible all season long. Air flow, keeping plants off the ground, and allowing plants to grow well are keys to a successful garden and make all the difference between a frustrating and a bountiful experience. In the flower gardens around Red Wagon, we will also demonstrate ways to prune perennials and pinch annuals to create strong growth with lots of blossoms. We have timed this workshop so that you will leave with the knowledge to make your garden productive and beautiful right away. There is always lots of pruning and trellising to be done in mid-June, and it is the perfect time to pinch perennials and annuals for maximum summer and fall blooms. As always with Red Wagon workshops, we will serve a light lunch, and we seek to make this a fun learning environment full of fellow plant lovers. Sign up with a friend and make an outing of it! This photo was taken in Havana, Cuba. While we won’t be using this exact trellising system, we will be showing you some similar examples that will be easy to recreate at home. Join cookbook author, Molly Stevens, and Red Wagon Plants owner, Julie Rubaud, in this fun evening of grilling, eating and talking herbs. We will demonstrate some easy and fun new ways to grill over charcoal using herbs. Dishes will include locally raised meat, and our own vegetables and herbs from the garden, providing you with some fun ideas for summer. If you are new to cooking over charcoal, we will show you how easy it can be. And using herbs from your garden will take the flavors to a whole new level. Space is limited, so please register early. The timing of this workshop will be perfect for July 4th parties and to take advantage of a long summer evening in our beautiful setting. $100 includes a hand out, instructions and dinner. We will provide non-alcoholic beverages, and if you desire wine or beer, feel free to BYOB. Are you ready to take your garden to the next level? Have you noticed how hard it is to have nice lettuce and salad greens, cilantro, dill, and in the heat of summer? We can help with that! Come to this workshop and learn some helpful tips, strategies and information about specific varieties that will make your summer garden productive with beautiful and healthy salad greens. We will provide recipes, hand outs, demonstrate techniques in the garden, and refreshments. Our workshops are a fun thing to do with a friend! Join Red Wagon owner, Julie Rubaud, in our Herb Farm Kitchen and classroom space. Together, we will make herb salts, an herb based salad dressing, and herbes salées, a traditional Quebecois way of preserving herbs used as a condiment on just about anything. If you grow culinary herbs and are not sure how to store them for winter use, this class will give you a few new options. If you are curious about improving your cooking with the simple use of herbs, you will not be disappointed. As with all of our classes, we create a fun learning environment with fellow plant and food lovers. Bring a friend and make an outing out of this class! $50 fee includes recipes, 3 products to take home, and refreshments. In this class, we will make a flavor filled red salsa that we will preserve in jars for winter use. This salsa stores really well, and keeps all the flavors of your summer garden available to you during the cold dark days of winter. Together, we will chop, stir, and preserve in a hot water bath. If you are new to canning, this class is a perfect entryway into the world of simple food preservation. In addition, we will go over the steps for making a green salsa that uses up all the green tomatoes in your garden before frost hits. Think ahead to how great it will feel to open up jars of your own salsa, grown with ingredients from your garden. Burritos, tacos, chips, nachos will be getting quite the make-over! $50 Workshop fee includes two jars of salsa, recipes, and snacks. Please feel free to bring your own wine or beer. From the Herb Farm Kitchen: Preserving the Tomato Harvest, Many Ways. This harvest season, we welcome you to our Herb Farm Kitchen for a series of intensive, hands on workshop that will show you a few different ways to preserve produce from the garden for flavorful eating all year long. In this workshop, we will focus on tomatoes. Red Wagon owner, Julie Rubaud, will take you through the steps of her favorite tomato preserving techniques from roasting to pureeing to dehydrating and you will take home some samples and printed out recipes. We will discuss tomato varieties, best ways to use the various styles of preserved tomatoes, and the benefits of freezing vs. hot water bath canning vs. dehydrating. $50 workshop fee includes samples of each product to take home, hand outs and a light lunch. Have you seen our mini-greenhouses? We love these for growing all kinds of crops early and late. You can easily add 6 weeks to your growing season with one of these hardworking, well designed cold frames. In this workshop, we will build a kit together that you can assemble at home. Soil and plants will be available for purchase at an additional cost. This construction style includes a new raised bed and the mini-greenhouse structure. We will send out instructions on how to prepare the site ahead of time once you register and are happy to discuss in further detail any questions you might have before registering. We recommend that you have a level spot, at least 6 by 10 feet in dimension, and that you remove the sod, grass, or lawn ahead of time. Alternately, you could cover the level spot in the spring with many layers of cardboard, leaves and mulch in order to kill the grass and prepare the groundwork for your new cold frame raised bed. During the workshop, we will go over timing of your planting and what varieties do well in a protected season-extension garden. We have sold many of these cold framers to very happy customers, and now offer you a chance to do it yourself. Sign up with a friend and make a day of it. Come learn with fellow plant lovers and the great staff at Red Wagon and you are welcome to tour the greenhouses and herb farm afterwards. $250 includes the raised bed and mini-greenhouse kit, hand outs, and refreshments. Plants, soil and delivery (if needed) sold separately. See a video of Julie planting one of our cold frame this past fall. We construct these mini greenhouses out of the same materials that go into our production greenhouses: 6 mil plastic, hoops bent at just the right angle to shed water and snow, polycarbonate end walls, wiggle wire and extruded metal track for securing the plastic closed, and pipes that act as a brake for keeping the sides just where you want them. We are happy to give you a demo, or come and peek at ours when it's all planted and growing along nicely. You can roll up the sides, you can close it securely and easily, or even take the plastic all the way off once the weather warms up. The frame can act as part of a trellis system for tomatoes giving them a warm and dry environment as they size up, and then you can take the plastic all the way off and let them grow through the top of the frame. Just add a few horizontal lines of twine and, voila! Instant tomato trellis! Plants are nicely tucked in and cozy warm, no matter what the weather! You can easily get a two to three week jump on either end of the season with this kind of structure. The raised bed means that the soil warms and dries long before regular garden beds, and the tight, plastic cover provides warmth on cold nights. You can keep the sides rolled down on chilly, cloudy days, but it is best to roll them up a bit in the morning; it can get quite warm in there as soon as the sun pops out. This type of greenhouse will allow you to harvest greens almost year round. It can also be used as a spot to start seeds, harden off plants, and gives you an extra zone of warmth if you would like to grow a perennial that is not usually hardy here. Try something unique this year, and make a fall planter using a pumpkin and succulents. This can live outside on frost-free days and nights, or can stay indoors as a table centerpiece or decoration. We will carve out the pumpkins together and help you select and design something that will look great for the weeks to come. This planter will last a few weeks, but then will need to be disassembled and potted into a more permanent vessel. The plants we help you select can be grown as houseplants for years to come. This is a kid friendly event - they may attend at no additional charge, but only one planter per family / group. $50 fee includes all the materials and refreshments. Join us in the greenhouses after hours to enjoy a beautiful evening making herb planters that will get you in the mood for spring, and will add lots of vibrant flavors and fragrances to your life. Most herbs are very cold hardy and make a lovely decorative planter that is useful too. Mix and match herbs that will grow well together and that you love to use in your cooking. Workshop fee includes a large pot, soil, and up to 5 herb plants. We will provide instruction and tips on care and use. Light refreshments will be served, and if you wish to drink wine or beer, feel free to BYOB. Have you wondered about how to grow your own Cannabis plants but not sure where to start? Confused about the difference between THC and CBD? Or the terms hemp, cannabis, marijuana? Join Chad Donovan in our Red Wagon classroom space to demystify the process and to learn about the art of Cannabis cultivation . For decades Cannabis cultivation has been a hidden practice of some, but now as the country’s view on cannabis is changing, plants are coming out of the literal closet and into the garden. For many, this is a new and exciting time. Join Chad as he answers your questions and concerns while guiding you on the path to your first successful harvest. Seminar topics include; legality, plant physiology, cultivation, propagation, maintenance, fertilization, harvest, and processing/preserving. This seminar will be loaded with information and quality handouts, however, please feel free to bring all and any questions that you have. We will be using plants in this class that are classified as CBD strains. We will not be offering any plants or seeds for sale of THC strains. $100 workshop fee includes hand outs, refreshments. CBD strains of hemp plants may be available for sale. These are strains that have been tested to have almost no THC (the psycho-active component of marijuana) and are used for medicinal purposes. Join Hattie White for a step by step look at how to help our most vulnerable allies, the pollinators. This workshop will go through the plant selection process of planting a pollinator garden. We will be learning more about the wide variety of our at-risk native pollinators, their life cycle, and how to plant for all stages of a pollinator’s lifecycle. Different site conditions will be discussed and how to choose plants for the sun or shade, and dry or wet soils. Participants will go home with resource lists and a comprehensive plant list for their gardens. $30 fee includes handouts, a custom planting plan and refreshments. Instructor Bio: Hattie White is a garden professional with a passion for helping people feel more connected to the landscape around them with education, resources, and enthusiasm. She has been working in the nursery trade for over 8 years, specializing in perennials with a focus on native plants and sustainable garden techniques. Currently she is in the process of getting her horticulturist certification and works at Red Wagon Plants during the season. Hattie also owns Apis Garden Coaching, which specializes in helping gardeners of all levels with a wide range of projects, from plant IDs, project management, site specific plant lists, and custom resource guides to native/pollinator gardens and small scale ecological garden design. In the off season she spends her time researching new plants and techniques, learning botany, and a wide variety of crafts at her home in Underhill, VT.
Our Retail Greenhouses will open for the season at 8 am on April 12th. Please come see some of the exciting changes we have made and get to know the plants that are ready for you to take home. We will close out the day with our annual cocktail party co-hosted with Caledonia Spirits. Food and additional beverages will be provided by Farmers and Foragers. This is a great evening full of friends, old and new, enjoying plants, greenhouses and each other. All of our greenhouses will be open and you can wander through and embrace that spring is indeed here. Have you been stumped by artichokes, cardoons, celery, celeriac, cauliflower, leeks, onions? In this workshop, Red Wagon owner, Julie Rubaud, will take you through the steps you need to successfully grow these slightly tricky crops so that you can expand your gardening knowledge and repertoire. We will go over planting, mulching, soil and water needs, row covers, spacing, and specific tips and tricks so that you can try something new this year, and ensure a good rate of success. Workshop fee of $30 includes hand outs, recipes, some materials, and a coupon for 2 of these (4” or 4-pack) plants once the greenhouses open. Light lunch will be served, featuring some of the vegetables discussed. Come visit the warm and plant filled greenhouses while winter lingers and mud season settles. We will have lovely herbs and pansies and houseplants and succulents for you to take home. Some of our seeds will be out, you can visit the new classroom space and see the improvements we have made to our retail greenhouses. We will be having our one day only promotion on gift cards (an extra 10% added to cards over $100 in value) and we will help you sign up for workshops and events. Lots is planned for 2019, and we are eager to share it all with you. Red Wagon owner, Julie Rubaud, will take you on a tour of the greenhouses at noon.